I looked in the refrigerator at work today. All of the cans of coke were white. "Only diet", I said with disgust. So I looked under the sink where we keep our excess (warm) soda and there was a new plastic wrapped rectangle of soda with properly colored red plastic. "Good" I said, "at least in a little while I can have the cold can of sugary soda I am craving". To my dismay, all of the cans inside were white. It took me a couple of minutes to figure it out. Cans of proper non-diet coke are no longer red, they are white. Coke spent years training me that red means sugar and white means diet. Now they are giving us sugared coke in white cans? 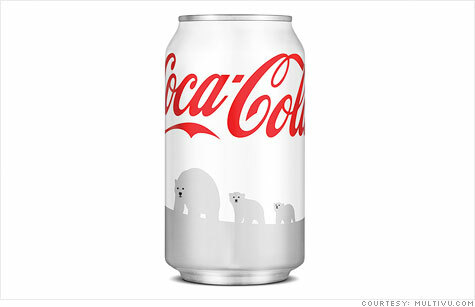 I googled it and found out it has something to do with some Coke company marketing ploy to be seen as loving polar bears. Am I the only one annoyed by this? It seems to me that to someone who is diabetic this might be a real problem. [+3] - maxdancona - 11/24/2011[size=150][b]I AM A MAN OF GOD[/b][/size]. YOU ARE A TROLL. Why are you posting videos of diet coke. I DO NOT DRINK DIET COKE. I buy Coke, but I don't drink it. I like the look of the cans for this campaign. I just love creative marketing. I'm not old enough to remember when Lucky Strike cigarettes were packaged in green packs. But the story is famous in marketing and advertising circles. It seems that due to war-time needs during World War Two there developed a shortage of green dyes. So the Lucky Strike people (American Tobacco Co., I believe) decided to pack their butts into white paper packages. Wait, wait. That's not all. They started a new advertising campaign with the slogan "Lucky Strike Green has Gone to War." It was an instant hit with the gung-ho patriotic smoking public! A prime example of how to make a virtue out of necessity. I wonder if Coca Cola has a sudden shortage of red dye? I drank up a 12-pack of those things . . . tasted like Coke . . . The story I heard about Lucky STrikes was that they made the OD colored pack to market to the military .They didnt want a typical highly colored (red) and silver and white package to be visible in a battlefield. It was so popular that they also used the same OD package stateside. Hence "lucky goes to War"
I believe you've got that backwards, FM. As i understand it, Luckies gave up the green coloring as a part of the war effort, and switched to the white pack they've used ever since--and hence, Luckies go to war. So the carton Ive got in the attic was actually the cigarrette label that was in use until 1943? Huh, well, its still an artifact cause the pack that the written piece showed was the pack that Luckies stuck with for many years after the war. If you read all of that page, you'll learn that the owner (or CEO, or whatever) had had research done that told him that women didn't like the green pack. The whole "Lucky Strike goes to war" thing was just a cover to justify changing the pack to make it more appealing to the public. EDIT: I tried to copy the relevant paragraph, but apparently that's disabled on that page. Go to the page and read the paragraph at the bottom. I see how it is. I am not going to get any support here, am I. What's your hangup on red Coke cans anyway, max? White can means diet. White can has always meant diet. Diet Pepsi cans are white. Diet Dr. Pepper cans are white. Diet freakin' Moxie cans are white. This is one of the few constant things that a tired soul could depend upon in a chaotic world. When I see I refrigerator full with white cans I know that it is time to get more real soda, and a single red can in the sea of white can brighten a work day. And Coke zero's black isn't it? I dunno, I don't drink pop. I always thought Diet Pepsi was in a lighter blue can. Must look in the cold drink cooler in the stores in the weekend. It's about differentiation. If Red means sugar and White/Silver means diet, you can tell the difference instantly without though. Adding black and gold cans is fine since they aren't like the colors already being used and they simply mean different types of coke.